ARLINGTON, Va. --- The Navy diver hoisted a 60-pound life-support regulator onto his back, then donned a 30-pound metal helmet. Fellow divers connected his diving suit to an "umbilical" hose pumping in breathing gas and establishing communications with the surface. After receiving approval to enter the water, the diver descended into a large test pool at Naval Surface Warfare Center Panama City Division, Florida, home to the Navy Experimental Diving Unit. The diver's mission: demonstrate the effectiveness of the MK29 Mixed Gas Rebreather -- a prototype system that's the first of its kind within the Navy diving community, developed by Naval Surface Warfare Center Panama City Division. The technology is sponsored by the Office of Naval Research Global TechSolutions program. TechSolutions is ONR Global's rapid-response science and technology program that develops prototype technologies to address issues raised by sailors and Marines, usually within 12 months. 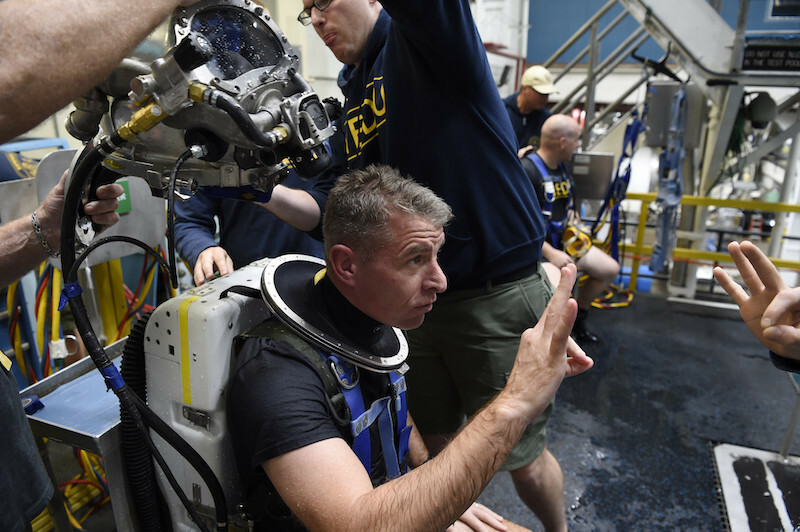 "This rebreather system is an awesome opportunity to enhance the capabilities of Navy divers and accelerate their deployments," said Navy Command Master Chief Petty Officer Matt Matteson, who heads up TechSolutions for the Office of Naval Research. Navy diving missions include underwater rescues, explosive ordnance disposal, ship hull maintenance, recovery of sunken equipment and salvage of vessels and aircraft. Beneath the waves, Navy divers breathe a mixture of oxygen and nitrogen. Below 150 feet, however, nitrogen becomes toxic -- leading to nitrogen narcosis, a drowsy state that can dull mental sharpness severely and jeopardize safe return to the surface. The solution is to replace nitrogen with helium. However, helium is expensive and hard to obtain because of recent worldwide shortages. And the Navy needs a lot of it for missions and training exercises, requiring canisters of the gas to be transported on accompanying ships or planes. The MK29 rebreather solves these problems. Used oxygen-helium is filtered through a carbon dioxide scrubber, which removes carbon dioxide and recycles the breathable gasses back to the diver. The result? Very little venting or wasted helium. "The MK29 decreases helium requirements by approximately 80 percent," said John Camperman, a senior scientist overseeing the development of the MK29 at NSWC Panama City. "Divers can perform more dives with the same amount of gas, or bring less helium." Test results suggest this system will be a major asset to Navy divers, who can not only perform more dives but also stay underwater longer if surface supply gas is interrupted. The MK29 even reduces breathing noise and fogging of helmet viewports. It's also the first piece of Navy diving equipment to feature 3D-printed titanium tubing that connects hoses from the helmet's breathing manifold to the regulator backpack. The titanium reduces the risk of breathing hoses being sliced by sharp or jagged underwater objects. The idea for the MK29 came from a Naval Surface Warfare Center Panama City Division master diver, who contacted TechSolutions seeking a way to reduce helium consumption while using newly available rebreather technology. Recognizing the expertise of Camperman and his team, TechSolutions asked them to develop the MK29. Camperman's research team will conduct further MK29 tests this year, and hope to see the rebreather issued throughout the fleet by next year.